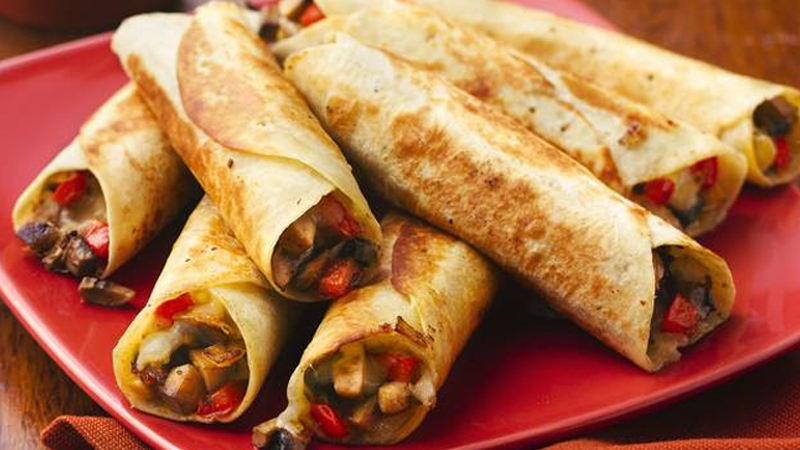 Meaning "flute" in Spanish, a flauta is a filled tortilla rolled into a thin, flute-like tube. Here you can have these ready in 30 minutes!! 1. Melt the butter in a large frying pan over a medium-high heat. Add the onion, pepper and garlic and cook, stirring, for 4 minutes. Add the mushrooms, oregano and salt and continue to cook for 4-5 minutes or until the onion and pepper are tender. 2. Divide the mixture between the tortillas, transferring the filling with a slotted spoon. Sprinkle each with cheese then roll up tightly and secure with a toothpick. 3. Wipe the frying pan clean with a paper towel. Heat the oil in the same pan over a medium heat until hot. Add the flautas and cook for 5 minutes, turning occasionally, until filling is hot and tortillas are toasted. You may need to do this is batches. Remove toothpicks before serving. • Serve with a salad of lettuce, tomatoes and cucumber.